Discord is a great platform, I’ve been using it since 2015, but it has its shortcomings. There are many people who’ve created bots to automate features and functionality that Discord has neglected. Here, I’m going to cover current and potential issues that we may need to invite or create a bot for. Many people are not thrilled with the number of channels that we have at the moment. It would be hard to trim them, though, and categories only do so much to reduce the bloat. Further more, there are channels that I have hesitated to suggest simply because of this issue. To solve this, we can create a channel as depicted here to enable easy opt-in roles that will hide or show channels, allowing us to curate a default that people initially have access to. The same bot could also hide the new #voice-to-chat channel unless a person is in voice. This was something Fletcher wanted to accomplish, but I’m raising it here as to discuss the bridges as a whole. There are existing IRC-Discord bridges that are reliable, and Matrix-IRC bridging is fairly reliable, but the most reliable Matrix-Discord I know of is… far less than so. Given the other bridges exist, we could use IRC as the middle ground, but that’s the least rich environment, and would contribute less to the bridging. I would suggest we write our own bridge, three way. This would free us from the mercy of hosted solutions issues, such as getting overloaded with traffic. Given the scope of Amethyst, I doubt moderation will become a serious issue in the near future. 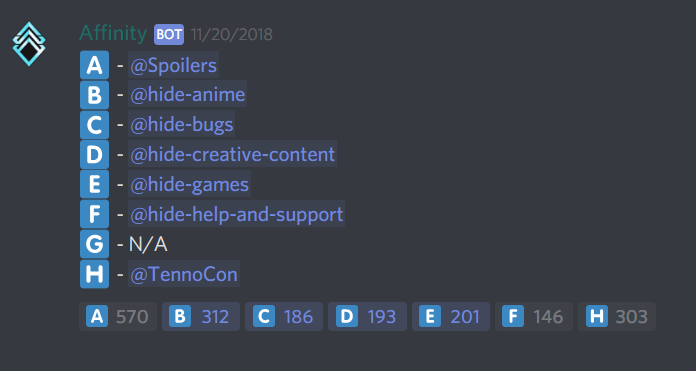 That said, Discord has a history of plagues of bots, and all it takes is one group of trolls to decide we’re an easy target for us to get “raided” (this is an actual phenomenon and concern for many Discords, I’ve personally banned hundreds of accounts across these incidents). There may come a time when we will need to take measures that Discord’s native moderation tools simple can’t keep up with. R Danny has a Raid Mode we can use, but we may also want to use a dedicated moderation bot. I would recommend Vortex, which is a bot that’s been around for a long while, and the developer of is someone I personally trust and can reach out to easily.